Tooled handles, toothpicks packed either 10 or 7 per box. The 10-pack box is individually polywrapped, the 7-pack boxes are not. Printing surface includes front, back and inside holder. Base price is 1-color on white coated board. Gold or Silver count as 2 colors. Foil stamping and embossing are available options, call for quote. Prices listed are per thousand boxes. Art and plate charges will be assessed on all first-time orders. FOB California. 5,000 per case, minimum order is 1 case (5,000 units). 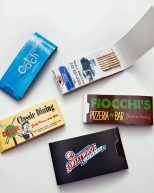 If you’re looking for something different, toothpick boxes are a great new way to promote your business in addition to custom printed match books. Your customers will keep these in their pocket or purse, in the car, or around the home.